I’m no data pioneer, exploring big buckets of data, going through great lenghts to understand and visually present the data. My main gig is still SEO (search engine optimization) but I flirt heavily with analytics and data on the side. One really cool project by Microsoft Research is called SandDance. 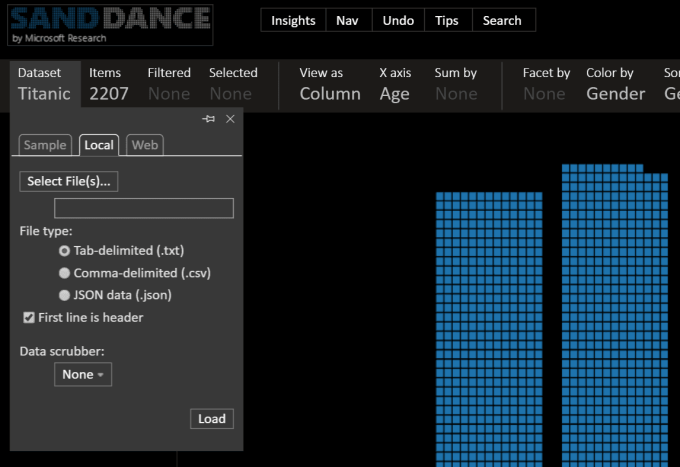 If you’re looking for a tool to explore and visually present data – give SandDance a try. SandDance is a research project from the Visualization and Interaction Team (VIBE) in Microsoft Research spearheaded by Steven M. Drucker and Roland Fernandez. It experiments with a new genre of visualizations, where every data element is always represented on the screen, to help people explore, understand, and communicate insights in their data. When you first begin exploring the possibilities with SandDance you get to play around with some data from the famous ship Titanic. You’ll also start with a brief introduction to how you can use the tool, manipulate and change the data. It is fairly straight forward and easy to start playing around with all features. Visually present the data in different ways with ease. And the big high five from us all to Microsoft Research is the opportunity to upload local data to manipulate, understand and present with SandDance. When free and easy to work with tools like SandDance is available for the public, we (analysts and amateur data-poke-arounders) need do a better job marketing the tool and making sure that the right people get hands on time with it. Let’s share the crap out of SandDance.